Star Trek might be just a TV show for many of us, but some believe that such high-tech space exploration might soon become a reality. 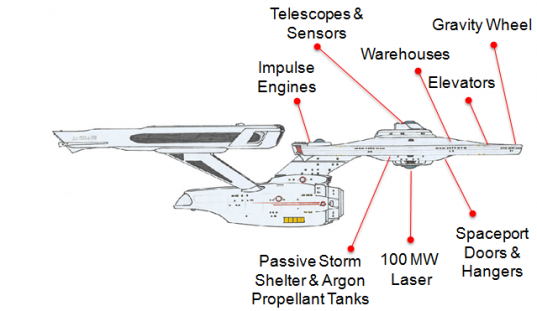 An engineer known simply as “BTE Dan” believes that with the technology currently available, it would be possible to create a full-size replica of the USS Enterprise, but instead of dilithium crystals, it would be powered by nuclear power. The plans, which have been put online (on Build The Enterprise), are incredibly detailed and even show a real-life version of the famous starship would feature a rotating saucer in order to simulate Earth’s gravity. It is important to note that this doesn’t appear to be the crazy ramblings of an over-enthusiastic fan. BTE Dan is apparently a systems engineer/electrical engineer who worked at a Fortune 500 company for the last 30 years. His experience has lead him to believe that a real-life USS Enterprise is not only plausible, but could be created in a mere 20 years (a lot better than waiting till 2245). BTE Dan’s plans for the starship (dubbed “Gen1”) would see the installation of an ion propulsion engine powered by a 1.5 gigawatt nuclear reactor. There would also be three additional nuclear reactors to create the electricity necessary for the entire ship. 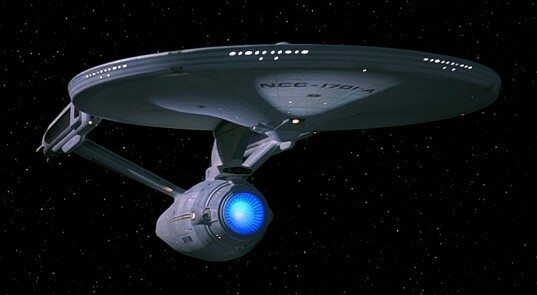 The ship’s saucer will be 0.3 miles in diameter and rotate as a suspended gravity wheel so that 1G of gravity is created allowing the crew to perform their tasks as they would under Captain Kirk. But once the ship is built – what then? We haven’t invented warp drive, so we can’t exactly head off to Alpha Centauri. BTE Dan believes that with a nuclear powered propulsion system, the USS Enterprise Gen 1 would be able to reach Mars in 90 days and the moon in three days. In between interplanetary missions, it will also be able to act as a space station and assist in asteroid mining. Equipped with a high-power laser (note: not phasers), the Gen 1 will be able to cut through the ice on moons such as Europa to reach the ocean’s underneath. The plan will also see new variants of the craft built, so that each new generation will become more technologically advanced than the previous – just like the Enterpise-A, B, C, D and E! Are you an engineer? Is this possible? Comment below. If not, I propose we boldly go where no man has gone before. Question - without an orbital dry dock, how do you plan on getting it up in space? Nuclear powered ion plasma is feasible for space but not enough thrust to lift anything off the ground let alone a space ship the size of a small town, without the invention owned and patented by Boeing, yes they have a working proto-type which they came out and told the world on CNN few years ago so they will not get shafted by the CIA, it's not enough to lift things into orbit but would make heavy things light enough to be lifted using any type of propulsion systems we have available now. We need to look to the most advance species in Star Trek to find the solution to the ship building, the Borg. Nanotechnology is the future and in the next 10 years or so i think we will basically have it. My idea would be to make a atomically precise ship with a atomically precise fusion reactor! Fusion btw is way better then plain old nuclear power because it creates unlimited power which if we could figure out how to focus that much power into the engines then weave got warp Scotty!! Star Trek might be just a TV show for many of us, but some believe that such high-tech space exploration might soon become a reality. An engineer known simply as "BTE Dan" believes that with the technology currently available, it would be possible to create a full-size replica of the USS Enterprise, but instead of dilithium crystals, it would be powered by nuclear power.